Tesla's quarterly results confirmed reaching production of 400 Model S's per week, showed continued large losses, but Musk promises profitability by Q2 2013. Tesla Motors is beginning turn the corner towards profitability, even while missing Tesla Model S delivery targets for 2012 and sustaining larger operating losses over 2011. In a conference call with investors and analysts on Wednesday, Tesla management appeared confident and painted an upbeat picture of Tesla's future. While the results failed to meet the lower expectations published in October 2012, Elon Musk talked through all the efforts being taken to fix problems and improve efficiency, all of which together should make Tesla profitable by Q2 2013. The stakes for the Q4 2012 results could not have been higher for Tesla Motors, because of their history of running heavy losses and staying afloat thanks to continuing infusions of money from investors. No company can keep that up for very long, even when backed by a billionaire. Last quarter was make-or-break time as the company sought to ramp up production to the 400 car/week level, and increase sales to the point of funding Tesla off of revenue. Original sales estimates of the Model S electric luxury car were 5,000 units in 2012, but in October after it was clear the company had supply chain problems they lowered the Model S sales estimates to the 2,700 to 3,225 range. Actual results were 2,750 Model S's manufactured in Q4 2012 and 3,100 manufactured in all of 2012. Of those the company delivered 2,400 in Q4 and 2,650 in all of 2012, missing the lower end of the lowered sales estimate by a smidgeon or two. As for reservations, the company reported 6,000 new Model S reservations in Q4 which was up from the 2,900 reservations received in Q3 2012. Elon Musk attributed the increased rate of reservations to the Model S price increase which went into effect on Dec. 31, 2012. New reservations so far in Q1 2013 are continuing to pour in, though at a slower rate than during Q4. There were some canceled reservations after Tesla invited a large number of reservation holders to configure their cars, and Musk said those cancellations were expected. Net reservations at the end of 2012 stood at 15,000, up from 13,000 at the end of Q3, or a 2000 reservation increase. Tesla management says that less than 30% of the market for the luxury car class the Model S occupies is inside the U.S., meaning over 70% of their potential market is outside the U.S. So far the Model S is only on sale inside the U.S. and the company is only now beginning to build stores and galleries overseas. The company has opened a delivery, distribution and assembly center in the Netherlands and announced European pricing for the Model S. During the conference call Musk talked about opening more stores in Europe, and that high on their list of stores to build are locations in Beijing and Hong Kong for Tesla Model S sales in China. As for Tesla's financial position, whether Tesla is bleeding profusely or whether Tesla is beginning to stabilize depends on how one looks at the numbers. Year-on-year the net loss (GAAP) widened from $254 million in 2011 to $396 million in 2013. However between Q3 and Q4 the loss shrank from $110 million to $89 million. Year-on-year revenues shot up from $204 million in 2011 to $413 million in 2012, and between Q3 to Q4 revenue went from $50 million to $306 million. The revenue increase in Q4 came directly because the company is now sustaining production at the 400 units/week level. They held that production rate for three weeks in December, and have maintained that rate so far in Q1 2013. It's to be expected that, assuming Tesla can maintain the Model S production and sales volume, revenue will firm up at or above the level of Q4 2012. During the conference call Musk predicted "we really have a very high confidence we will have a profitable first quarter (2013)" and later he said "I do think we'll be profitable in Q2 and subsequent quarters as well." For that to be true sales would have to remain as high, or higher than, the Q4 2012 level while shrinking costs to improve the margin. During the conference call Musk talked about the focus in Q1 2013 is on production efficiency and improving the margin on Model S sales. Until Tesla scaled up production, parts makers weren't willing to scale up their production or give Tesla a good price on parts. Now that the product rate is increasing, the parts makers are expected to give better prices. Meeting the production level milestone meant a lot of overtime, which averaged to 70 hour work weeks during December, and that has fallen to 50 hour weeks currently, with management targeting 40-45 hour work weeks by the end of March. When asked about offering the Model S under a lease program, Musk replied that they want to offer this in the second half of 2013. He went on to say Tesla does not need to offer Model S leasing to meet sales goals, and they aren't interested in making incremental revenue from leasing. This shows there's enough pent up demand for the Model S that Tesla sees little need to offer leases. Tesla's stock price was down $0.74 on the day, to $38.54/share, with heavy volume and losses in the last hour of trading. In after hours trading the price has fallen to $36.43 for a further loss of $2.20/share. Tesla's 2012 year-end target of 5,000 vehicles was a production target, not a sales target. By Dec 31, 2012, Tesla had roughly 15,000 paid reservations for the Model S sedan. 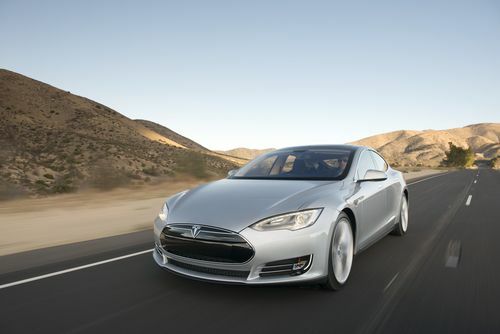 Much too much emphasis has been placed on Tesla's 2012 production target of 5,000 vehicles. This was an arbitrary goal, affected by hundreds of variables during the factory's steep production ramp-up during Q3 & Q4. Tesla did the right thing in making vehicle quality their top priority, even if it meant missing that Dec 31 target. Now the factory is producing 400 vehicles per week and is on target to produce 20,000 units in 2013.